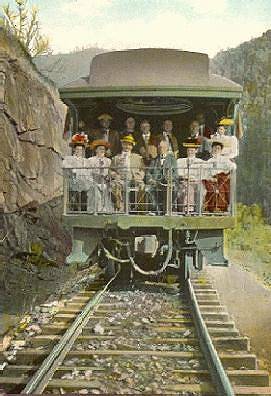 The Yosemite Valley Railroad was completed in May of 1907 between the California Central Valley town of Merced, and El Portal, the western boundary of Yosemite National Park. The railroad was 78 miles long, and catered to Yosemite visitors during most of it's 40 years of existence. Upon completion of the railroad, a three car passenger train was ordered from Hick's Locomotive and Car Works of Chicago. 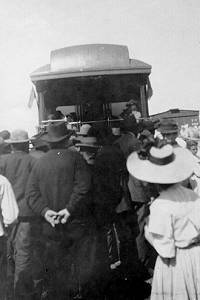 One of these wooden cars was an observation car, with a rear platform surrounded by an ornate railing. Instead of naming the car, it was worked into the YV numbering scheme as #330. 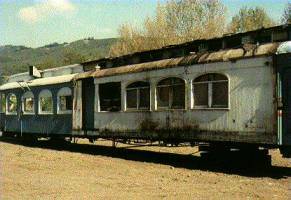 The car was used throughout the life of the railroad, although for a short period of time a newer observation displaced it to standby status. 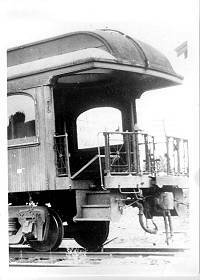 The newer steel car ironically was destroyed by fire in 1937, and the #330 returned to full service. Upon the abandonment of the railroad, the dismantler Al Schader took a liking to the car and had it shipped to the Yreka Western which he managed. 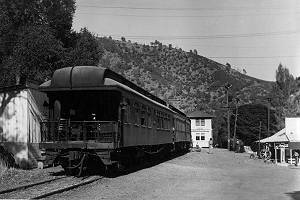 Apparently the car was seldom if ever used on the railroad, but was parked on a spur which abutted the main street of Yreka, and served as Al's residence when he visited from San Francisco. Al passed away in the early fifties, and the car was converted to a diner. Eventually the spur was pulled up to make way for the I-5 freeway, and finally the land the car sat on was set to be developed. The property owner, Ralph Ramey was kind enough to donate the car to the city of Yreka, and moved it to their corporation yards, where it sat for another 12 years in an open field. The City of Yreka tried in vain to find a museum or individual to make use of the car, without success. The only interest expressed was by the Yreka fire department, who would use it as a fire exercise. 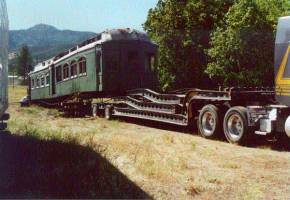 Larry Bacon, the city attorney, and manager of the Yreka Western Railroad, made a last push to find a new owner, and this proved successful. 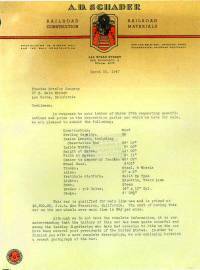 Through three well known railfans, Clayton Guest, Al Rose and Jack Burgess, I was contacted. Jack, Claudia (my wife) and I made the trip in March of '95 to Yreka to assess the prospects. It was a windy cool day, and old blue wisps of a tattered tarp fluttered through the vacant windows and doors. If this description sounds bizarre, it's intentional, as I found the moment to have an ethereal quality. My wife had the same feeling. Unfortunately, the car itself looked structurally compromised. We agonized over whether to buy the car or not until June, when we made a second trip to Yreka to clean up the car. By the end of that weekend the decision was a go. We were fortunate to find an excellent trucking firm to transport the car, Rushway Inc, of Newcastle, CA. They in turn referred us to Chris DeWitt of the Nevada State RR Museum, who is a sucker for hard luck projects (see Dan Markoff's Eureka lisades engine!). Chris, Jack, myself and our spouses formed the first volunteer crew. The move was planned for August 24th, 1995 - exactly 50 years to the day the railroad was abandoned. After considerable cursing, and two "drops" of the car (3 vertical inches, 8 horizontal inches, 1 year off everyone's life), the car was on the road by 2:30 PM. After a two day trip the car arrived in the bay area, and we unloaded it the next week at Morgan Hill. 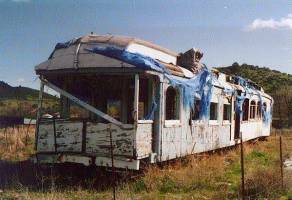 In early 2005, we moved the #330 from Morgan Hill to the Niles Canyon Railway in Sunol, CA. With the help of Bubba's Lowbed and many volunteers, we simultaneously moved the #330 from Morgan Hill and the trucks from Roaring Camp & Big Trees Railroad to Niles Canyon. The primary goal is to restore the car to it's original livery and look at the time of delivery. For example, the conduits that were retrofitted onto the car roof when it was converted to electric lighting will be replaced by internal wiring. Also the yellow ceiling paint will be resored back to the silver leaf on light green, trimmed in natural mohagany. 20-30 years from now the car will be donated to the best available museum or railroad, complete with an operating fund. In the meantime we will operate the car, and rent it to recover restoration costs.